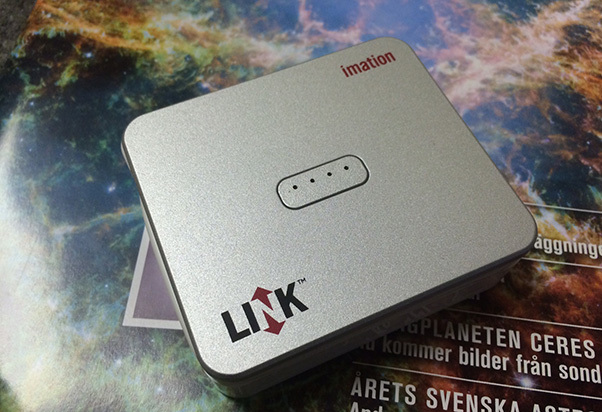 The Link Power Drive is a small plastic box with a silver top and white bottom. You can get it with 16GB, 32GB, or 64GB. It has a 3000mAh battery and a Lightning cable as well as a USB cable built in. It’s only 2.8″ wide and therefore fits perfectly in your pocket and is not a hassle to carry around. It also feel surprisingly light. It can charge your iPhone 5s to 100% in most cases, and your iPhone 6 to roughly 70%. Output is 1A. I did have one very slight problem getting it to actually charge my phone at first. But this problem was easily fixed simply by locating the power switch, which is hidden between the two cables. Most batteries like this you just press the power indicator and it starts charging, however here that was not the case. Not really an issue, but do keep in mind where the power switch is before you think it’s broken. The device itself seems a bit plastic, but after having used it for some time it feels quite sturdy and very reliable. To move things to and from the LINK power drive is very easy. Using your PC you just connect the power drive with the built in USB cable and drag and drop files. To do it on the iPhone or iPad you first need the Power Drive app, which is free. Then you just connect the power drive to your phone or tablet with the built in lightning cable. Using the app is super easy and straight forward. Besides moving around and deleting files you can also back up your contacts, which is pretty neat. And then the usual expected stuff, see how much storage space is left on the phone and the power drive. Additionally it has a built in stand for your phone. At first I couldn’t figure out what the pull out flap on the bottom was. My phone didn’t fit in it due to it’s thick case. But yeah, that’s a neat addition. Many iPhone users choose the cheapest version with less memory, some of them regret it if after a few weeks when the memory is full. Fortunately, there are several accessories on the market that solve that problem. 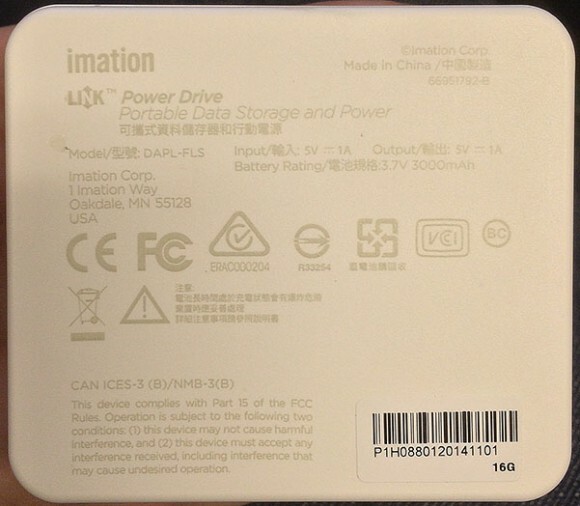 Imation Link PowerDrive is one of them and simultaneously acts as external battery. I really liked that feature, gives you a reason to actually bring it with you everywhere, increasing the chances of yo having it nearby when you need both extra storage and power. The device is simple to use and does exactly what it promises. 16GB might not seem like much, but you can still have a few movies for a long flight, and it’s a great place to backup your photos. Moreover, it is very easy to remove content and establish new locations. 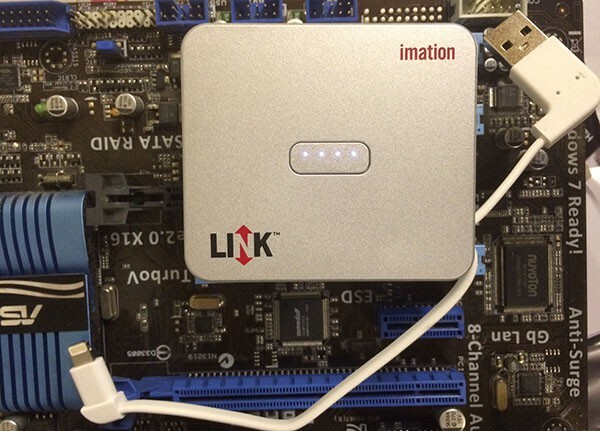 A compact device for battery and memory is convenient. But you do pay a bit extra for that combination, however from what I’ve found this is one the alternatives where you have to pay less extra. You can get the 16gb version from Amazon for $70. But as they are all on sale you might want to go for the 32gb version for only $10 more. The 64gb version is $111, and you can find it here.